I know I said that I would post every Tuesday but that has clearly hasn&apos;t happened. So, here is a Throwback Thursday blog post, just for you. I feel like it has been a hectic few weeks and I am in need of some tranquil peace and quiet. Just like my trip to Botany Bay, Broadstairs last year. Infamous for its beautifully stacked white cliffs and stunning views, the hidden gem of Botany Bay has been exposed by photographers and holiday makers over the years. I count myself lucky to have had the opportunity to travel there for a friend&apos;s birthday experience on the beach. Taking the train from London to Broadstairs, you can see the change from a busy city to the tranquil countryside and the beginnings of the coast. Travelling with seasoned photographers, much of the morning was consumed with building up a collection of beach landscape photography. Myself being a novice on my iPhone managed to get a few photos of the cliffs and a cheeky seagull walking into frame. However, I also really enjoyed catching water Pokemon near the cliffside. It&apos;s somewhat sad to see how my Pokemon Go obsession died off so quickly. I didn&apos;t even make it to the Pokemon Go fest in London the other day. On the other hand, at least the local food on offer in the nearby Botany Bay Hotel Restaurant is here to stay. 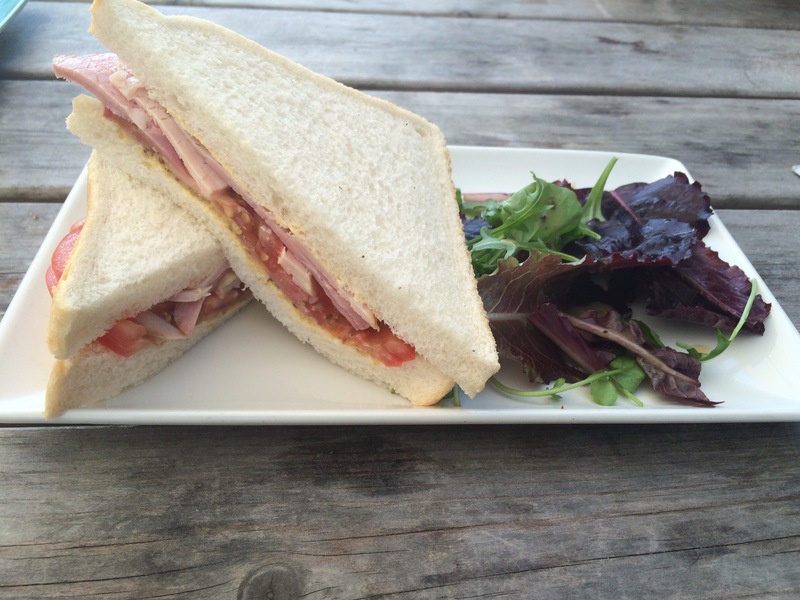 The typical packed lunch style Ham Sandwich was on the menu. Sounds boring for such a beautiful sunny afternoon out but it was anything but. Hand crafted with tender ham, fresh tomato on soft white bread and a spread of honey mustard sauce. this was a tasty handheld snack. Totally a great option if you are not super hungry or if you don&apos;t want to fap about with cutlery. I on the other hand just couldn&apos;t come to all the way to the beach and not have some coastal food. So, I tucked into some Traditional Cod and Chips and mushy peas. The crunchy ale battered exterior of the locally caught fish pulled away splendidly to reveal a steaming hot white cod fillet. The only problem was that it was in desperate need of salt and pepper. Looking back now I wouldn&apos;t mind if they also fixed the mushy peas either. Surely, they should not have been so creamy. For my vegetation friends at the table, there was an Asian Style Veggie Burger. This in comparison to the fish was nicely spiced and dripping in sauce and the taste of tangy pickles. 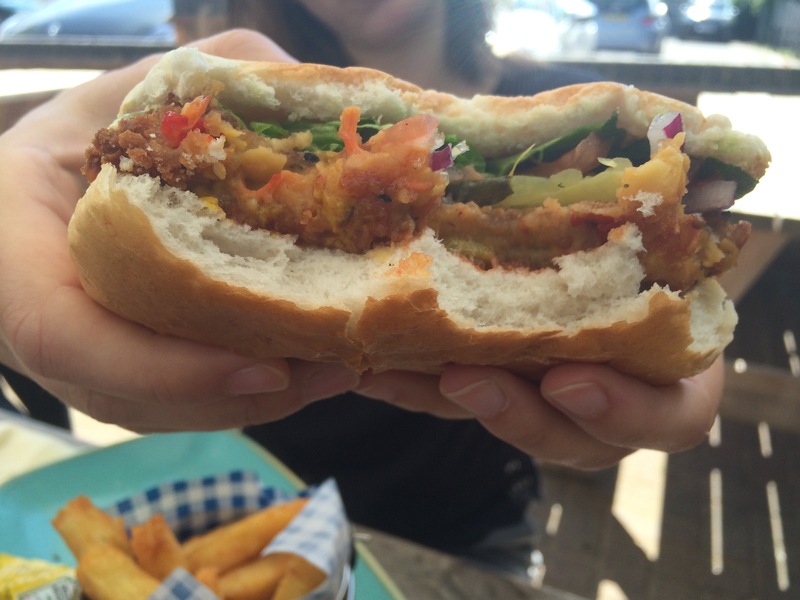 Both the veggie burger and the meaty Steak Burger version fit perfectly into your hands. 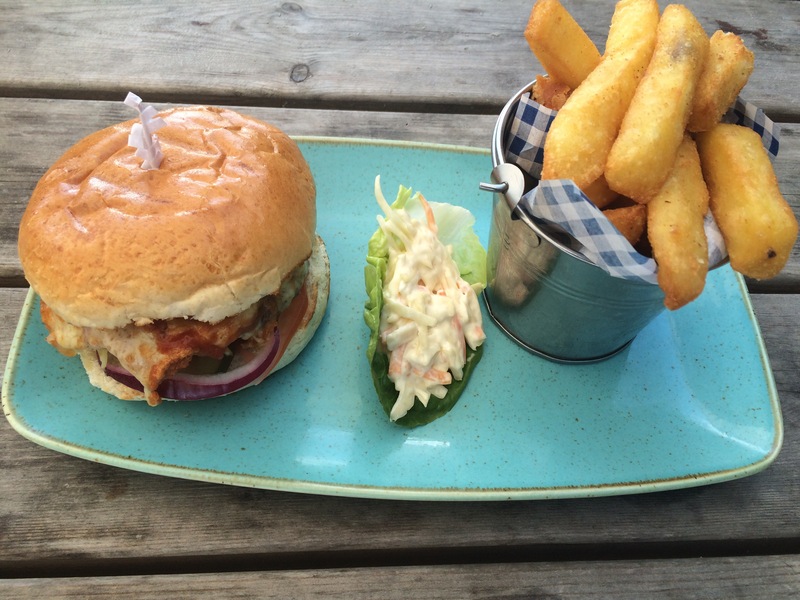 The creamy coleslaw was the best side dish for the steak burger. Super flavourful! Like the tales of smuggled goods on sands of Botany Bay, I would like to be brought back just for the food in front of the lovely sea views. The Botany Bay Hotel Restaurant menu has changed since this trip but there are still many local options to choose from such as the kippers. Maybe when I come back I will reserve a room in the hotel for the night. It would be wonderful to catch the sunrise and the receding tide while eating breakfast but until then, it looks like I will be eating at home. Luckily for you though, next week&apos;s blog post will feature a special take away and food delivery app review made especially for the comfort of your own home. I can&apos;t wait to tell you all about it! So, keep calm and carry on!